The Germany pavilion at Epcot has some fun shops and good food. The caramel popcorn is one of my favorite snacks at Walt Disney World. 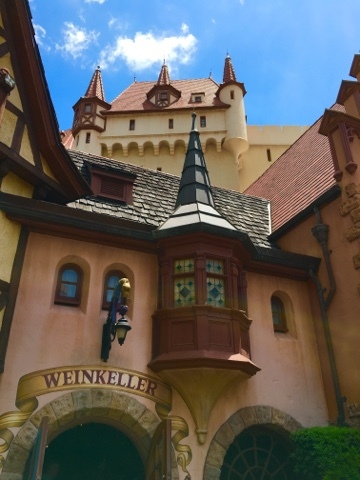 I took this shot of the Weinkeller a few days ago while walking around World Showcase. 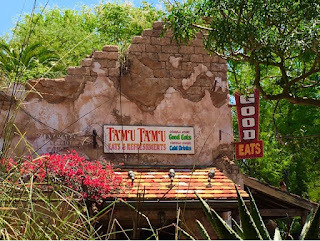 The Tamu Tamu refreshment stand is now an ice cream spot in the Africa section of Animal Kingdom. It features the famous Dole Whip. 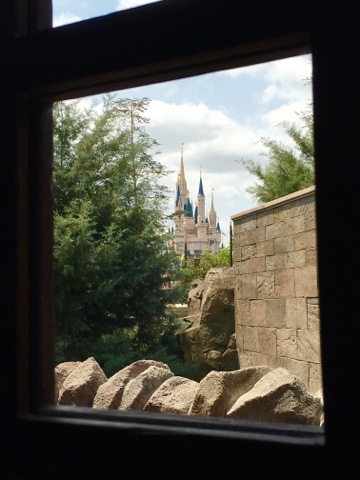 I took this shot while sitting in the outdoor covered waiting area of Tusker House a few days ago. The Biergarten is a festive restaurant, with live entertainment, in the German pavilion at Epcot. Today, I dropped by to take a few quick photos around lunchtime. 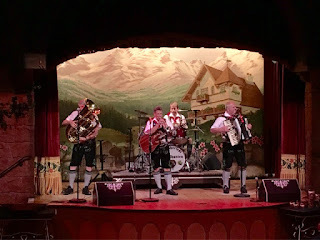 The band was playing a polka at the time I snapped this shot. 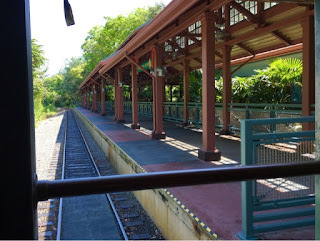 The Wildlife Express is the train that takes guests to Conservation Station from the Africa section of Animal Kingdom. I was giving a tour when I snapped this shot today. I was in the back car and took the photo as we pulled out of the station, on our way back to Africa. Echo Lake is located in the center of Hollywood Studios. I took this photo a few days ago while standing next to Dinosaur Gertie's ice cream stand. You can see Min and Bill's Dockside Diner across the lake. Columbia Harbour House is one of my favorite quick-service restaurants in Walt Disney World. 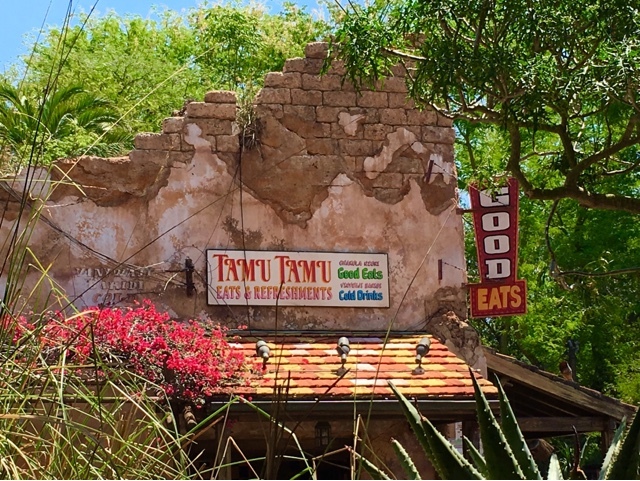 It serves a nice variety of food in a fun, colonial atmosphere. A few days ago, I found myself sitting on a bench, across from this spot, while hundreds of guests were passing by. However, for a brief second, there was nobody in my view except for this appropriately dressed cast member. 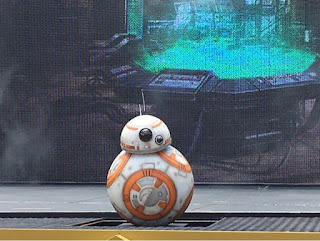 BB-8 was instantly thrust into fame as soon as the latest Star Wars film, The Force Awakens, debuted in December. However, today was the first time I've seen this full size version of the droid entertain guests. He is part of the new "Star Wars: A Galaxy Far, Far Away" stage show at Hollywood Studios. I took this shot while giving a "Star Wars" focused tour today. 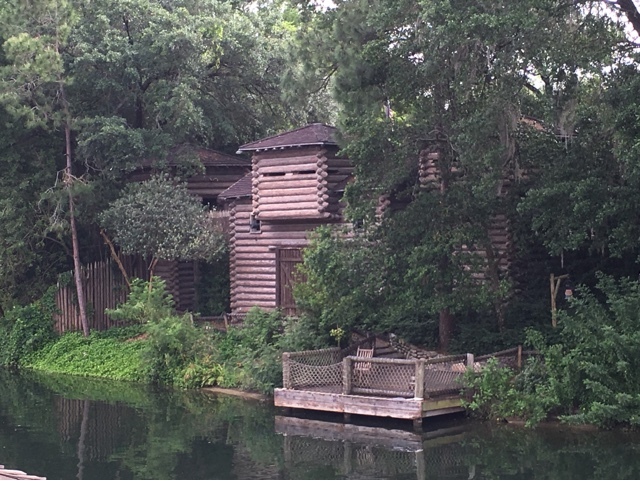 Fort Langhorn is a fun spot on Tom Sawyer Island, where guests can fire "guns" and explore the rustic surroundings. The island can only be reached on motorized rafts, but the fort can be seen from the mainland. I took this shot from near the exit of Big Thunder Mountain today. Today, while giving a tour at Magic Kingdom, I noticed this view of the Space Mountain sign. I was in the area between Carousel of Progress and the restrooms. As I got a little closer, I was able to frame the sign with this tree. 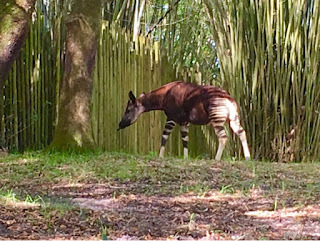 The Okapi is an interesting animal. It is in the giraffe family, but its backside looks like a zebra. This particular Okapi is brand new to Animal Kingdom, and today was his first day "onstage." I took this shot on the Pangani Forest Trail while giving a tour this morning. 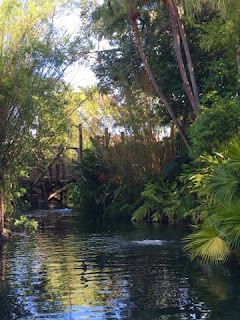 This "river" runs from the hub of the Magic Kingdom right down into the Jungle Cruise. I was standing in the area of that attraction when I took this shot today. 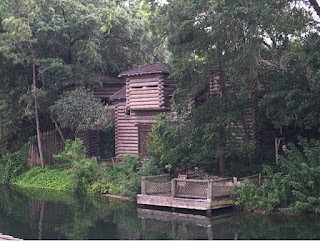 You can see the bridge to the Swiss Family Treehouse in the photo. This may be the last Streets of America shot I ever get, as the demolition of this area has begun. 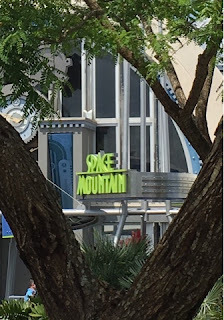 It is definitely a bittersweet time at Hollywood Studios. While it is tough to see areas of this park going away, I am certainly excited for the Star Wars and Toy Story lands that will soon be under construction. Although, it will take years for these projects to be complete, I'm sure the wait will be worth it. One of the many unique things about Epcot is that the monorail travels into the park. It allows visitors to get a sneak peak at Future World before actually walking through the entrance. 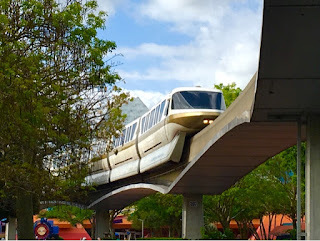 I took this shot last week, not far from Journey Into Imagination. Not only does the Flower and Garden Festival feature exhibits, food, and plantings at Epcot, but it also adds dozens of characters to the park. Of course, there is no more famous Disney icon than Mickey himself. 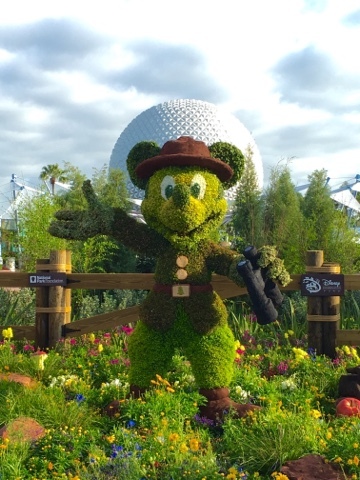 I like his placement this year, with Spaceship Earth in the background. 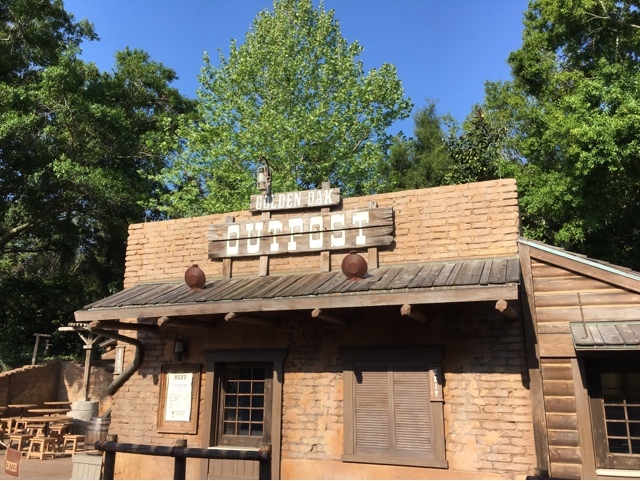 Golden Oak Outpost is a quick service stand in Frontierland. It is a seasonal spot, currently specializing in chicken breast nuggets and waffle fries. I took this shot a few mornings ago, while giving a Magic Kingdom tour. 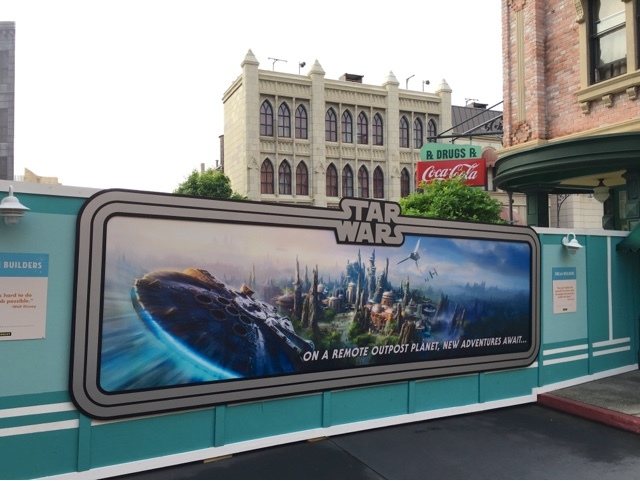 Disney continues to add more Star Wars entertainment to Hollywood Studios. Today, I watched Captain Phasma lead the First Order's force of stormtroopers from Star Wars Launch Bay to the center of the park. Although it was sad to see more Hollywood Studios attractions close last week, it is exciting that construction will soon begin on the Star Wars expansion. 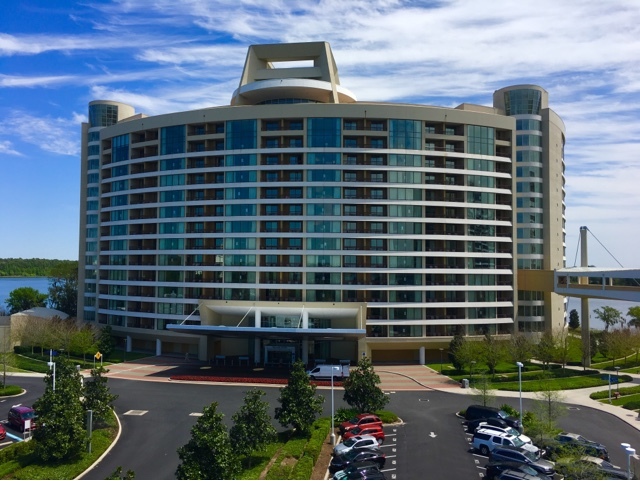 The Grand Floridian is the flagship resort at Walt Disney World. The buildings are impressive and the grounds are beautiful. 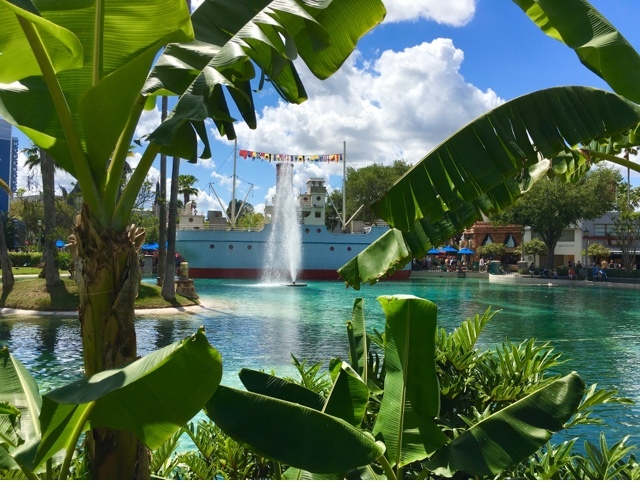 I took this panorama today, after grabbing a bite to eat at Gasparilla Island Grill. I have taken hundreds of photos of Cinderella Castle over the years, but this angle was unique. 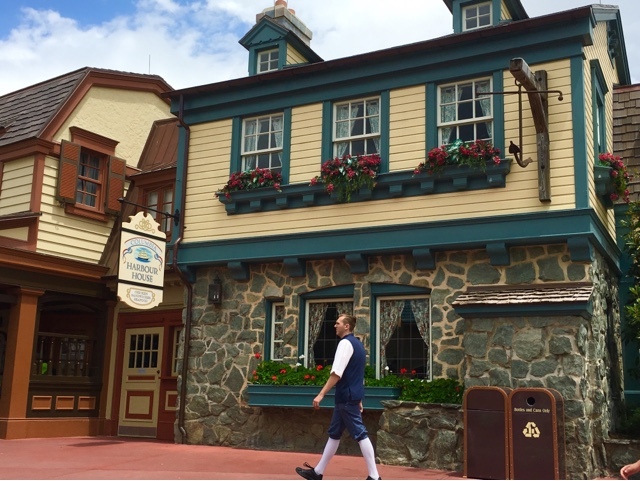 As I was having lunch at Gaston's Tavern today, I had this view from my table. You can see the window helps to "frame" this shot nicely. 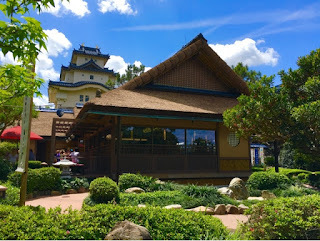 I grabbed a quick bite at Katsura Grill while giving a tour at Epcot today. This restaurant is located in the Japan pavilion. 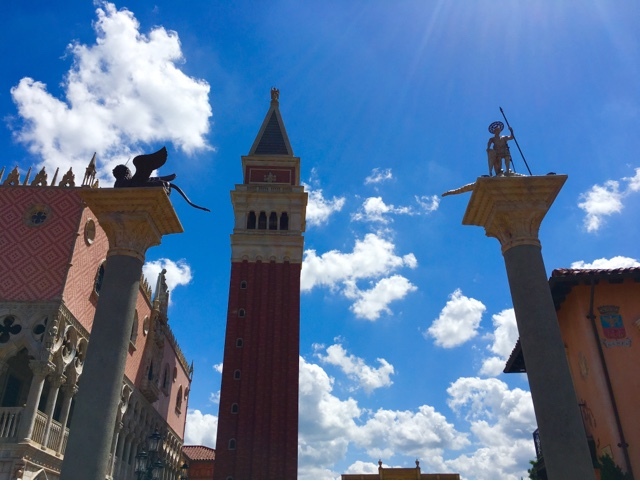 In my opinion, that area is one of the most scenic spots in World Showcase. This morning was picture perfect for taking pics at Animal Kingdom. The air was cool with very low humidity. 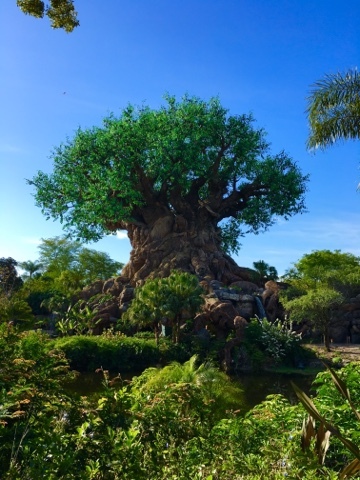 This is a shot of the back of the Tree of Life, as seen from the walkway between Africa and Asia. Peter Pan's Flight is one of my favorite classic attractions. However, the darkness makes it nearly impossible to take any good pictures. 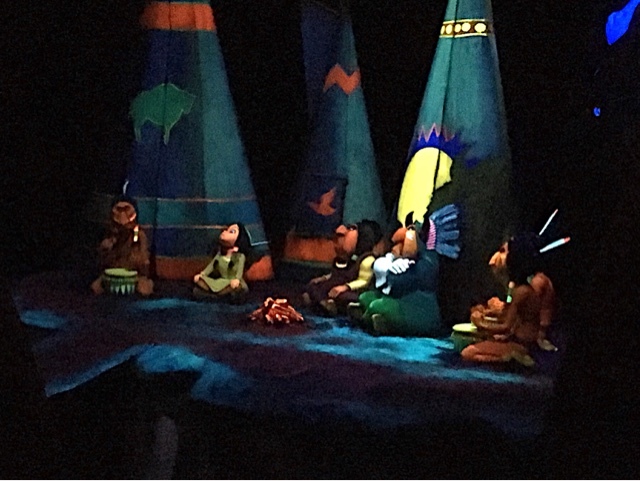 Yesterday, though, the ride stopped while I was riding it, and I was able to get this shot of the Indian scene. 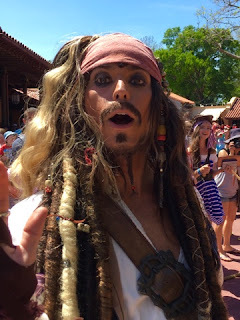 Captain Jack Sparrow's Pirate Tutorial is a popular show in Adventureland. It features a Johnny Depp lookalike who does a great job. One of my tour guests was picked to perform in the show today. 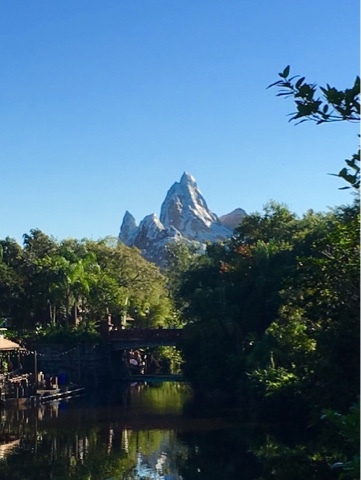 Today we say happy 10th birthday to Expedition Everest at Animal Kingdom. This amazing attraction has been the cornerstone of Asia since April 7, 2006. 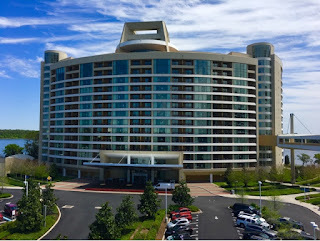 The tallest structure in Walt Disney World, at just under 200 feet, Everest is an impressive site. I took this shot a few months back, from one of the bridges that crosses the Discovery River. The Walt Disney World Railroad presumably carries freight, in addition to Magic Kingdom guests. 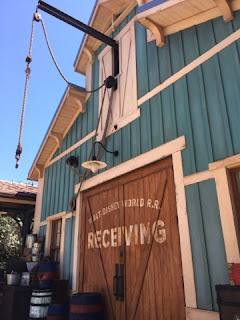 You can see this "loading dock" on the side of the Storybook Circus station. 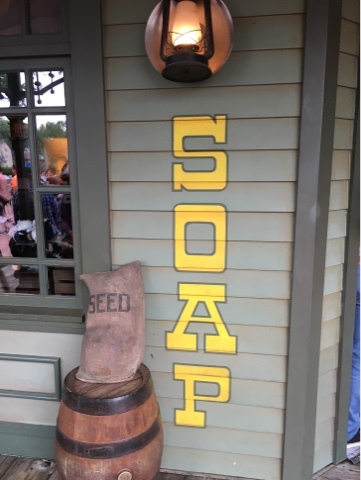 This area is highly themed, and it is another example of details that are most often overlooked by guests. Disney's latest movie, Zootopia, has been a huge box office hit. 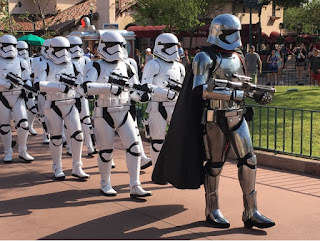 It makes sense that the two main characters would eventually show up in the parks. 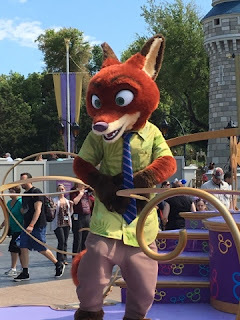 I took this shot of Nick Wilde today, as he was dancing in the Move It, Shake It, Dance It, Play It street party. 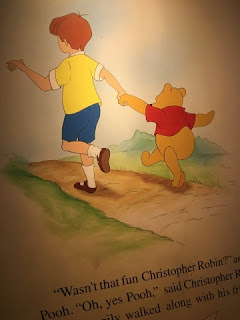 The Many Adventures of Winnie the Pooh is a popular attraction in Fantasyland. Although it is less than 20 years old, it is a classic Magic Kingdom "dark ride." This wall is at the very end of the ride, and is the conclusion of the story. I took this shot today, while riding with my family. Since I'm half Italian, I like visiting the "homeland" country at Epcot whenever I'm in World Showcase. This area resembles St. Mark's Square in Venice. I took this shot a few days ago, while enjoying the Flower and Garden Festival with friends. Frontierland is full of great details that would be found in the old west in the 1800s. This storefront advertises "soap," which must have been a hot commodity in that era. I took this shot while giving a Magic Kingdom tour a few days ago.